Global social changes that diffuse across the world from country to country often proceed most quickly in those places that start last. Change in the pioneer regions is delayed by the extra effort required to overcome the obstacles to new ideas or practices; regions that join the trend later can draw on the experience of the leaders to speed the process up. But the case of the global decline in fertility during the demographic transition is different. For here, the region that started the decline last, sub-Saharan Africa, has experienced the slowest decline of any world region. This is widely, though not universally, recognised by demographers: see Casterline (2001), Bongaarts (2008), and Bongaarts and Casterline (2013). 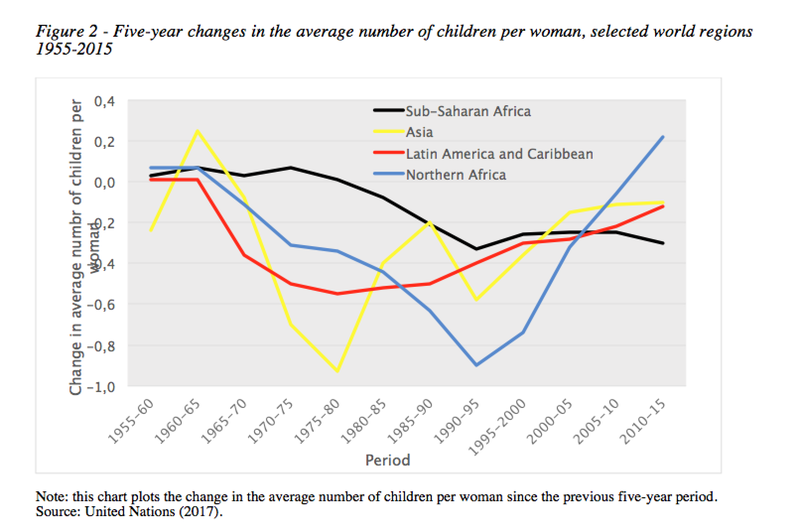 In Shapiro and Hinde (2017), we re-examine the pace of fertility decline in sub-Saharan Africa and other regions of the developing world by presenting the latest available United Nations data in a novel way. We confirm that the speed with which fertility is falling in sub-Saharan Africa is substantially slower than has been the case in Asia, Latin America and the Caribbean, and Northern Africa. 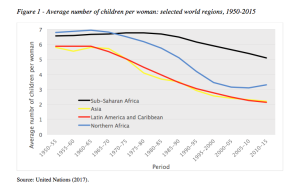 Figure 1 shows the average number of children per woman for sub-Saharan Africa (SSA), Asia, Latin American and the Caribbean (LAC), and Northern Africa (NA), for the period from 1955 to 2015. 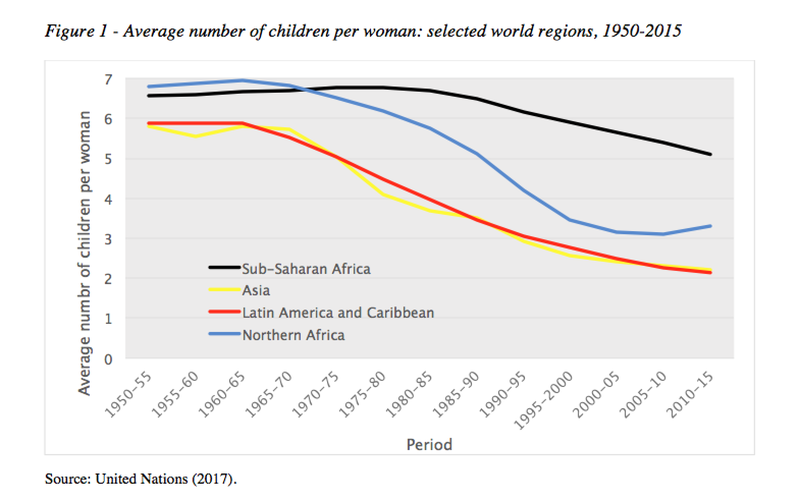 The highest fertility levels in all regions apart from sub-Saharan Africa were achieved in 1960-65 (5.8 children per woman in Asia, 5.9 in LAC and 6.9 in NA); sub-Saharan Africa’s peak fertility came later, in 1975-80, at 6.8 children per woman. By 2010-15, fertility in Asia and LAC had declined to an average of not much more than two children per woman, and in NA to between three and four children per woman. The average woman in SSA, though, even today has around five children. The demographic transition involves two ‘legs’: a decline in mortality followed (usually after a time lag) by a decline in fertility. The decline in fertility is called the fertility transition. A characteristic of the fertility transition is that once it has begun, there seems to be no going back to high fertility. Demographers have devised a range of ingenious methods for working out the date that the fertility transition in any one country started. The most widely used is the 10 per cent rule (Coale and Treadway 1986). 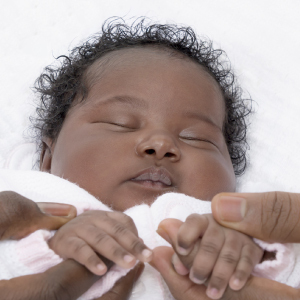 This rule dates the onset of a fertility transition as having taken place once the average number of children per woman in a country or region has fallen by at least 10 per cent from a previous peak. Of course, in some countries and regions the ‘peak’ is more like the edge of a plateau, as fertility was fairly constant for a long period before the decline started. However, it is rather curious to date the transition from a point after it has begun. Better would be to use the 10 per cent rule to identify that the transition is happening, but then to date the start from the end of the period in which peak fertility occurred (Casterline 2001, Bryant 2007). The criterion of a 10 per cent decline distinguishes a genuine fertility transition from random fluctuations in fertility, but once the 10 per cent criterion has been met, the onset of fertility transition is deemed to be immediately following when the peak occurred. This approach of dating the decline from peak fertility corresponds at least in part to how economists date recessions and recoveries (see, for example, National Bureau of Economic Research 2017). We might call it the peak fertility rule. Figure 2 shows changes in the average number of children in the four regions across five-year periods since 1955-60. The changes are negative in Asia, LAC and North Africa from the late 1960s, but in sub-Saharan Africa they do not turn negative until the 1980s. Using the 10 per cent rule to identify the start of the fertility transition, we get 1970-75 in Asia and LAC, 1975-80 in NA, and 1995-2000 in sub-Saharan Africa. The peak fertility, though, came earlier as we have seen (1960-65 in Asia, LAC and NA; 1975-80 in sub-Saharan Africa). Figure 3 uses the peak fertility rule to identify the start of the fertility transition. 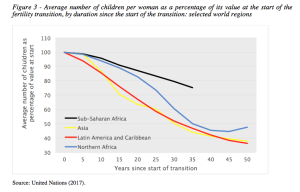 It plots the average number of children per woman as a percentage of the average number at the start of the fertility transition (on the vertical axis) against the number of years since the start of the transition (on the horizontal axis). 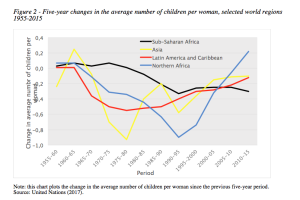 After 35 years of fertility decline, women in sub-Saharan Africa were still having, on average, 75 per cent as many children as they were when fertility was at its peak. In the three other regions, after 35 years of fertility decline, fertility was below half its peak level. It is clear, therefore, that sub-Saharan Africa’s experience is different from that of other regions: its fertility is declining at about half the rate that fertility declined elsewhere in the developing world. Why might this be? One clue is the lower level of variability within sub-Saharan Africa in the pace of fertility decline than was experienced in the other regions. This suggests that there may be pan-African (or at least pan-sub-Saharan African) cultural factors which act as a drag on fertility decline. Two possibilities are the continuing importance of the extended family and child fostering, both of which may be associated with a high demand for children who ‘belong’ to the extended family, rather than their biological parents. Besides, the solidarity associated with the extended family reduces the costs of children to their biological parents. 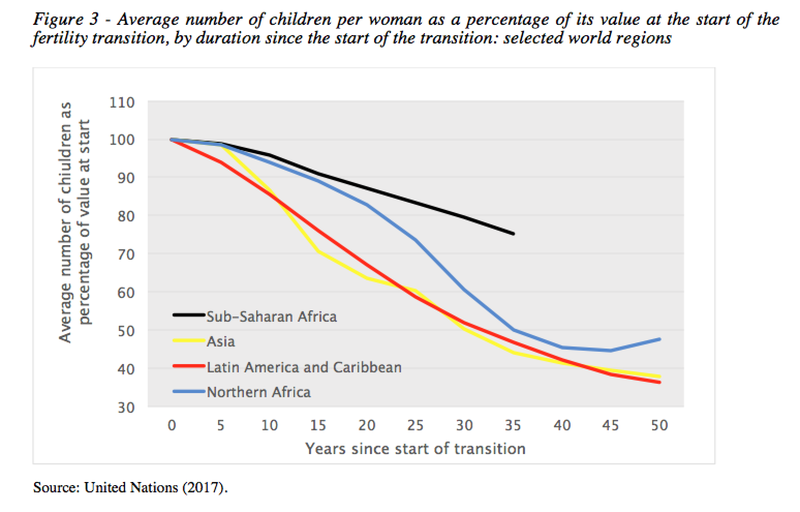 So sub-Saharan Africa’s fertility transition is, so far, slower than that in other regions of the world. Moreover, there are no obvious signs of it accelerating. The implications of this for the future population of the region, and of the future geographical distribution of the world’s population, are profound. Bongaarts, J. (2008) Fertility transitions in developing countries: progress or stagnation? Studies in Family Planning 39(2): 105-10. Bongaarts, J. and Casterline, J.B. (2013) Fertility transition: is sub-Saharan Africa different? Population and Development Review 38 (Supplement 1): 153-68. Bryant, J. (2007) Theories of fertility decline and the evidence from development indicators. Population and Development Review 33(1): 101-27. Casterline, J.B. (2001) The pace of fertility transition: national patterns in the second half of the twentieth century. Population and Development Review 27 (Supp. ): 17-52. Coale, A.J. and Treadway, R. (1986) A summary of the changing distribution of overall fertility, marital fertility, and proportion married in the provinces of Europe. In A.J. Coale and S.C. Watkins (eds. ), The Decline of Fertility in Europe, pp. 31-181. Princeton: Princeton University Press. National Bureau of Economic Research (2017) Statement of the NBER Business Cycle Dating Committee on the determination of the dates of turning points in the US economy. Accessed 25 July 2017. Shapiro, D. and Hinde, A. (2017) On the pace of fertility decline in sub-Saharan Africa. Demographic Research 37: 1,327-1,338. United Nations (2017). World Population Prospects: the 2017 Revision, DVD Edition. New York: United Nations Department of Economic and Social Affairs, Population Division.